Once your cat has been diagnosed with diabetes, you will work with your veterinarian to treat this disease. In 2010, the American Animal Hospital Association issued a set of guidelines to clarify current treatment of diabetic animals. Reading this article and perhaps printing out a copy to take to your vet will help organize your thoughts and will let you know the treatment approach animal diabetes experts take. Please make sure your veterinarian is up to date on the current professional guidelines to treatment of diabetes. Your pet may have high blood sugar, specifically glucose, (hyperglyemia) and even high urine glucose (glycosuria) for reasons other than diabetes. Diabetes is diagnosed when these high levels persist. Unless your pet is extremely ill, hospitalization for diagnosis and initial treatment is not necessary. You may periodically return to your vet for testing, or even better, you can use a very simple human glucometer to test your cat's blood at home. This is much less stressful for the cat and for your budget. Cats cannot properly process carbohydrates due to lack of a certain liver enzyme. Feeding cats carbohydrates can eventually harm them in a number of ways, including the development of diabetes. Your cat should be eating a low-carbohydrate, high protein WET food. All dry cat food, including prescription diabetic food, includes too many carbohydrates for cats. You don't need to spend a lot of money on a low-carb wet cat food. "Fancy Feasts Classics" is an excellent low cost choice, among others. Lisa Pierson DVM has an excellent website where you can learn more about feline nutrition. Many cats who start on wet food have blood glucose levels return to normal and do not need insulin. If your cat is already on insulin and you switch from a dry to wet food diet, please home test your cat's blood. Giving insulin to a cat with normal blood sugar levels can injure or even kill your beloved pet. Your kitty may continue to have high blood glucose levels even once he starts on a controlled, wet-food diet. Insulin therapy is the only way to properly reduce the blood sugar to normal levels. In the USA, the available appropriate insulins for cats are glargine (Lantus) and protamine zinc (PZI). Insulin is a powerful drug. You will need to monitor your cat's blood, preferably at home and daily, to ensure that the appropriate amount is given. "Start low and go slow" is good advice for insulin administration. Start with no more than 1 unit of insulin every 12 hours as the dose. Wait at least several days to assess the full effect of the dose. 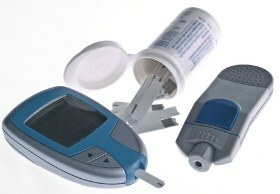 If a blood test then shows more insulin is needed, never increase by more than 1 unit at a time. One week after insulin therapy is started your vet should re-evaluate your pet even if you are home-testing. If for some reason you cannot test the blood glucose at home, the urine sugar levels should be tested using Keto-Diastix test strips (requiring collection of urine) or by using glucose-detecting crystals added to the litter. Close attention to changes in your cat is critical and should be documented. Never hesitate to take your cat to the vet if it becomes ill, acts strangely, has trouble walking or loses weight. Weigh your cat weekly. As you can skill and confidence, treatment of feline diabetes becomes much easier. With your care, assisted by your vet, you cat can live a long and healthy life.